Below are the official 2017 Hockomock League Girls Indoor Track All Stars, selected by the coaches in the league. Attleboro, 5 vs. Dighton-Rehoboth/Seekonk, 1 – Final – Attleboro’s PJ Elliott netted a hat trick while Jake Parker and Dylan Wallace each scored once for the Bombardiers. Franklin, 2 @ Canton, 1 – Final – Click here for a recap of the game. Oliver Ames, 4 @ Mansfield, 3 – Final – Cullen Gallagher netted a pair of goals, including one shorthanded, to lead the Tigers. Max Ward opened the scoring for OA while Zach Walsh had 24 saves in net. OA head coach Sean Bertoni said Korey Sweezey and Matt McCormick had strong performances. North Attleboro, 4 vs. Bishop Feehan, 1 – Final – Jason McNeany scored in the first period to open the scoring before Feehan tied the game right before the horn. Erik Clements, Hunter Sarro and Anthony Zamiello each scored in the second period for the Rocketeers. Stoughton, 2 vs. Cape Cod Tech, 6 – Final – Jon Lessa and Josh Hough scored the goals for the Black Knights. Hanover Quad (Canton) – Canton went 1-2 for the day, picking up a win early but falling in the second two meets. The Bulldogs beat Norwell (36-30) before falling to Duxbury (43-31) and Hanover (40-39). Mike Melish Duals (Foxboro, Sharon) – Foxboro finished second overall. Braintree Quad (Mansfield) – Postponed. North Attleboro Quad (North Attleboro) – North Attleboro won three matches on the day, extending its winning streak to seven. The Rocketeers bet Plymouth North (55-9), Norton (39-31) and Burrillville (42-11) on the day. Marshfield Super Quad (Oliver Ames) – Oliver Ames picked up three wins in four matches at Marshfield High School. The Tigers beat Whitman-Hanson (63-12), Toll Gate (51-12) and Durfee (48-15) while falling to Marshfield (42-33). Liston Funai (132) went 4-0 with three pints while Dean Pacini (195) also went 4-0. Cobey Williamson (120), Brandon Belleton (138) and Chris Belleton each went 3-0 on the day. Joe Savino, Eric Berardi, Sean Cosgrove, Billy Tat and Jack Mills each had two wins for OA. Sandwich Quad (Taunton) – Taunton’s Josh Grasso picked up three wins via pin on his way to a first place finish at 125. Alex Simon (170) and Nuno Camara (182) each placed second while freshman Woudanly Danger (220) finished third. Attleboro, 29 vs. Mansfield, 71 – Final – Mansfield placed first in eight events to take down Attleboro. Mike Shannon won the 300M (37.51), Nick Rispoli took first in the 600M (1:27.99), Patrick Heavey won the 1000M (2:42.92), Jack Olsen won the high jump (5-04.00), Kevin McCree won the shot put (41-07.00) and Cameron MacIntyre won the 55M hurdles (8.27). The Hornets also won both the 4×200 and 4×400 relays. Attleboro’s Isaiah Rodriguez won the 55M dash (6.73), David Seybert won both the 1 Mile (4:39.36) and the 2 Mile (10:12.67) and Victor Centeno placed first in the long jump (20-11.00). Canton, 26 vs. Milford, 65 – Final – Milford junior Jack Kalil set a new school record in the 2 Mile, finishing in 10:15.80 to beat the previous record by nearly two seconds. Milford also got wins from Cameron Clark (38.02) in the 300M and the 55M hurdles (8.35), Chris Cicciu (1:28.40) in the 600M, Joey Madden (2:44.96) in the 1000M and Kevin Truong (19-02.00) in the long jump. Canton’s Muhammad Sambo won the 55M dash in 7.16 while Jack Healey was first in the 1 Mile (4:58.80) and Ben Mendillo won the shot put (33-02.25). Foxboro, 51 vs. Stoughton, 49 – Final – The Warriors swept the 55M dash and the high jump to edge Stoughton. Nate Rogers (6.99), Owen Whitney (7.25) and Hunter Williams (7.28) went one-two-three in the 55M dash while Matt Nutting (5-10.00), Whitney (5-06.00), and Rogers (5-06.00) were the top three in the high jump. Other Foxboro winners included Williams in the 300M (39.94) and Brendan Foley in the 600M (1:34.29), as well as the 4×200 relay team. Stoughton’s Will Eckhart (3:01.66) and Terry Lapomarede (3:05.99) were first and second in the 1000M, Colin Cochran won the 1 Mile race (5:10.98), Zach Ferreira won the 2 Mile race (11:08.05), Kyle Reason finished first in the 55M hurdles (8.59) and the long jump (18-00.50) and James Tarchara (43-03.00) won the shot put. Franklin, 36 vs. Taunton, 64 – Final – Taunton grabbed first place in nine different events to pick up a win against Franklin. Dylan Lynch won a pair of events for the Tigers, finishing first in the 1 Mile (4:49.28) and the 2 Mile (10:06.78). Jadin Bruneau won the 55M dash (6.93), Lucas Alves was first in the 300M (37.85), Jimmy Hoye took first in the 600M (1:31.33), Ryan Leason (39-01.00), John Chretien (37-10.00) and Jared Taje (37-05.25) swept the shot put, Nathan Grant was first in the high jump (5-06.00) and Sam Krajewski won the long jump (18-09.25). Franklin won both the 2x400n and the 4×400 relays while getting a win from Nicolas Gnamen (2:50.74) in the 1000M. King Philip, 54 vs. Oliver Ames, 46 – Final – A sweep in the shot put helped King Philip edge Oliver Ames. Alex Olsen (41-06.00), Gio Fernandez (40-09.75) and Ter Jacobs-Baston (37-03.00) placed first, second and third, respectively for the Warriors. Freshman Michael Griffin won the 1000M (2:44.92), freshman Michael Norberg took first in the 2 Mile (10:58.20), senior Ethan Dunne crossed the line first in the 55M hurdles (8.20) and Aeden Angelone took first in the high jump (5-10.00). Oliver Ames’ Kalil Matier was first in the 55M dash (7.15) and the long jump (20-01.00), Belmund Rodrigues-Pires took first in the 300M (37.37), Matt Campbell finished first in the 600M (1:30.38) and Zane Reservitz crossed first in the 1 Mile (4:50.59). The teams split the relays with KP winning the 2×400 while Oliver Ames came in first in the 4×400. North Attleboro, 55 vs. Sharon, 45 – Final – The Rocketeers earned a sweep at high jump and Jonathan Shultz won a pair of individual races to edge out the Eagles. Shultz was first in the 600M (1:33.73) and the 55M hurdles (8.36). Nick Rajotte won the 55M dash for North Attleboro in 6.78 while Matt Reimels was first in the 1000M (2:41.48). Matt Tarantino (6-00.00), Omar Jasseh (5-08.00) and Mario Bresko (5-06.00) swept the high jump. For Sharon, Tianrui Sun won both the 1 Mile (4:42.05) and the 2 Mile (10:29.53) races. Matthew Hoffman won the 300M (37.84), Patrick Carries (44-07.50) and Jeffrey Thomas (44-02.50) went one-two in the shot put and Juvan Elisma was first in the long jump (20-11.25). Attleboro, 11 vs. Mansfield, 89 – Final – Mansfield won 11 of 12 events, sweeping in five of them. Amanda Mangano won the 55M in 7.82 and was first in the high jump at 4-11.00, Mikaela Maughn finished first in the 300M (46.21), Alexis Kiyanda took first in the 600M (1:58.13), Caitlin Whitman crossed first in the 1000M (3:18.32), Julie Romano won the 1 Mile (6:02.32), Lauren Duggan was the top finisher in the 2 Mile (12:32.69), Heather D’Ambra took first in the 55M hurdles (10.59) and Olivia Horn took first in the long jump (14-09.50). Attleboro’s Tianna Ridge won the shot put at 27-09.25. Canton, 48 vs. Milford, 51 – Final – Milford’s Chrissy Speliakos won the 55M hurdles in 9.25, the long jump (15-08.75) and ran the anchor leg on the 4×200 relay that clinched the victory for the Scarlet Hawks. Milford also got a win from freshman Juliana France in the 600M (1:48.07). Canton’s Selena Cho was first in the 55M dash (7.89), Hannah Link won the 300M (44.12), Sarah Collins was a double winner, taking first in the 1000M (3:36.67) and the 1 Mile (5:49.50) while James Polsgrove was first in the 2 Mile (12:51.71) for the Bulldogs. Freshman Bronwyn Mahoney had a first place finish in the shot put (27-08.00). Foxboro, 73 vs. Stoughton, 27 – Final – Senior Angela VandenBoom won a pair of events while grabbed first in 11 of the 12 events. VandenBoom won the 300M (45.00) and the high jump (4-07.00). Freshman Amanda Walden won the 55M dash (7.94), Meredith Cronin was first in the 600M (1:46.78), Nicole Yeomans placed first in the 1000M (3:40.38), Lexi Quinn won the 2 Mile race (12:20.26), Malaysia Cabral won the 55M hurdles (10.29), Solange Stamatos won the shot put (26-05.75) and Ana Sanchez was first in the long jump (15-05.00). Stoughton junior Mia Greene (6:02.07) won the 1 Mile race with Amelia Cochran (6:06.94) finishing second. Franklin, 67 vs. Taunton, 33 – Final – Franklin sophomore Halle Atkinson won a pair of individual races and anchored the 4×200 relay to a win. Atkinson won the 55M dash in 7.70 and took first in the 300M in 43.19. The Panther’s 4×200 crossed first in 1:52.80. Franklin’s Lauren McGrath also had a big day for the Panthers, scoring in three events. McGrath was second in the high jump (4-07.00), third in long jump (15-00.50) and second 55M hurdles (10.18). Taunton freshman Victoria Gravel was first in the 55M hurdles (10.10), senior Shannon Stokes won the high jump (4-09.00) and Samantha Tichelaar took first in the long jump (16-02.50). King Philip, 39 vs. Oliver Ames, 61 – Final – Oliver Ames placed first in eight of the 12 events while sweeping the 1000M race. Dana Lowney was first in the 1000M (3:13.53) while Jess Robarge was second (3:32.57) and Jessica Mills was third (3:32.87). Senior Elizabeth Hausman was first in the 300M (46.37), Lauren Wright won the 600M (1:45.83), Olivia Timbone crossed first in the 2 Mile (12:59.34), Desiree Snead won the 55M hurdles (9.44) Antonia Peretti was first in the shot put (28-10.25) and junior Rachel Clark (15-02.50) and freshman Madison Perry (14-09.50) finished first and second, respectively, in the long jump. King Philip’s Hannah Balunos was first in the 55M dash (7.90), Krista Cepkauskas was first in the 1 Mile (5:47.44) and Abigail McKeown won the high jump (4-11.00). North Attleboro, 49 vs. Sharon, 51 – Final – Sharon won seven events while North Attleboro claimed first in five in the closest race of the day. Junior Ariadne Tolay won both the 1000M (3:17.69) and the 1 Mile (5:29.53) for the Eagles. Angela Wallace won the 55M dash (7.62), Erica Laidler was first in the 600M (1:45.94), Maria Gieg won the 2 Mile (12:15.02) and freshman Jade Johnson won the long jump (16-01.75). North Attleboro got first place finishes from Rachel LaBonte in the 300M (43.83), Rene Gagne in the 55M hurdles (10.14), Julia Mechlinski in the shot put (34-04.00) and Samantha Gaskin in the high jump (4-11.00). King Philip @ Attleboro – Postponed to TBA. King Philip, 4 vs. Medway/Ashland, 1 – Final – King Philip raced out to a 3-0 lead through two periods and held off Medway/Ashland in the third. Olivia McCarthy opened scoring late in the first period, finishing off a rebound from a Katie Crowther shot from the point. Nicole Connor scored her first goal of the season 10 minutes into the second period on a wrist shot from straight away that found the top corner of the net. Liz Furfari closed the second period with her second goal of the season, driving hard to the net and slipping the puck between the goalies legs. In a penalty filled third period, Medway/Ashland brought the game within two goals, but Furfari added her second goal late to seal the win for KP. KP coach Jack Unger said goalie Lilly Potts had a great game in net to secure her second win of the season. NORTH EASTON, Mass. – With the Kelley-Rex title on the line, it’s no surprise that offense was at a premium and mistakes were few and far between at Val Muscato Stadium on Thursday afternoon. Oliver Ames entered its final league game of the year with a one point advantage over Mansfield, who still has a game to go. A win for either side would have clinched the Kelley-Rex division but the Tigers and Hornets finished 1-1 – their second draw of the season. Mansfield controls its own destiny with its last league game on Friday night against Canton at Gillette Stadium. A tie against the Bulldogs would mean a share of the title and a win would equal the division crown outright. Oliver Ames would earn a share of the title along with Mansfield if there is a tie and would win the title outright if the Bulldogs beat the Hornets. Between the weather – wind and rain – and the high stakes of the game, neither side was able to get into a real groove in the opening half. Mansfield had the best two chances of the half, starting with Stephanie Kemp‘s shot in the seventh minute that was saved. Four minutes later, Mansfield’s Hannah Reiter nearly opened the scoring, ripping a shot from just inside the area that looked destined to sneak under the crossbar. Instead, Oliver Ames junior keeper Regan Benton timed her jump perfectly, punching the shot over the bar. Oliver Ames’ back line of Dana Lowney, Zoe Chazan, Emily Freeman and Maggie Ault– with Claudia Ferrara in front as a defensive mid – limited the Hornets from registering any other chances. On the other end, center backs Emily Vigeant and Emily Sullivan anchored the Hornets back line with Allison Verge, Mikaela Maughnand Kerina Geminianiall seeing time as outside backs in front of keeper Emily Gaumond. Both teams settled down in the second half as the rain ramped up. It took the Hornets less than four minutes into the second stanza to find the opener. Mansfield earned a free kick along the right sideline, just outside the area. Vigeant delivered the service to the near post where Reiter ran onto and latched onto it with a volley that found the far post for a 1-0 lead. “With her, you have a leader that’s been through some battles,” Smith said of Reiter. “Her club team has been #1 in the nation, she’s played in the finals. She knows what it’s like to play in big games. She’s just a field general out there, she’s calming people down. She actually called our timeout, she said we needed it because we were a little flustered and I trust her to make judgements like that. Oliver Ames was close to finding the equalizer in the 62nd minute when Chazan’s free kick from the wing hit off the crossbar and out. Two minutes later, Mansfield almost doubled the lead when Bryn Anderson connected with Kemp but her bid was over the bar. A minute later, the Tigers did come through with the tying goal. Freeman, from her own half, delivered a perfect diagonal ball through Mansfield’s defense. Lauren Wright ran onto and slotted her shot past an oncoming Gaumond, the ball hitting the far post and going in to make it 1-1. The Hornets had a chance three minutes after OA’s equalizer with a pair of corner kicks. On the first, Vigeant’s service skipped through the area for a close chance but Freeman was in perfect position to block the shot. With a lot of numbers pushed forward at the end, Oliver Ames had one final chance in the final seconds. After a partial clearance, OA’s Jess Robarge sent a ball back in that was deflected down. Junior Abby Reardon sprinted towards the ball but Gaumond came off her line and smothered the loose ball to preserve the tie. Mansfield (14-0-3, 12-0-3) will look to earn the division title when they play Canton at Gillette Stadium on Friday at 8:00. Oliver Ames girls soccer (13-0-4, 12-0-4) will conclude the regular season with a trip to Brockton on Saturday at 1:00. 1st Quarter: (S) Izon Swain-Price 16 yard rush, Josh Cocchi XP good; (S) I. Swain-Price 6 yard rush, J. Cocchi XP good. 3rd Quarter: (S) Justin Ly 6 yard rush, J. Cocchi XP good. 4th Quarter: (S) I. Swain-Price 79 yard rush, J. Cocchi XP good. 1st Quarter: (C) Alec Ragusa 40 yard rush, Thomas Monagle XP good. 3rd Quarter: (S) Drew Naisuler 1 yard rush, Mitchell Director XP good; (S) Juvan Elisma 71 yard rush, XP no good. 4th Quarter: (S) Xavier Hackett 82 yard rush, M. Director XP good. 1st Quarter: (NA) Chad Peterson 82 yard pass to Kyle McCarthy, XP good; (NA) C. Peterson 38 yard pass to Nick Rajotte, XP good. 2nd Quarter: (NA) Bobby Mylod 3 yard rush, XP good; (NA) C. Peterson 54 yard pass to B. Mylod, XP good. 3rd Quarter: (NA) C. Peterson 14 yard pass to B. Mylod, XP good. 4th Quarter: Game called after three quarters due to weather. Attleboro @ Franklin – Postponed to 10/22 at 3:00. Taunton @ King Philip – Postponed to 10/22 at 2:00. Mansfield @ Oliver Ames – Postponed to 10/22 at 2:00. Mansfield, 2 @ Franklin, 0 – Final – Mansfield’s Jed Tolbert notched his sixth shutout of the season and the Hornets cashed in twice in the second half to beat Franklin. Sam Hyland headed home a corner kick from Sean Lanzillo in the 49th minute for the game-winner. Cullin Anastasia doubled the lead in the 73rd minute, finishing off a direct kick from Lanzillo. North Attleboro, 1 @ Stoughton, 1 – Final – North Attleboro sophomore Justin Renehan scored his first career goal with 11 minutes to go in the game to put the Rocketeers ahead but Stoughton found the equalizer with just over two minutes to go. Stoughton sophomore Fabio Ponce De Leon scored the tying goal after a service into the box from a free kick passed by Marco Antunes. Shawn Watters had four big saves for the Rocketeers. King Philip @ Taunton – Postponed to 10/22 at 10:00AM. Oliver Ames, 4 @ Attleboro, 0 – Final – Kiana Lozzi scored a pair of goals as Oliver Ames improved to 12-0-3 on the season. Lauren Wright and Jess Robarge each added a goal while Zoe Chazan, Emily Freeman and Jackie Mills each had an assist. 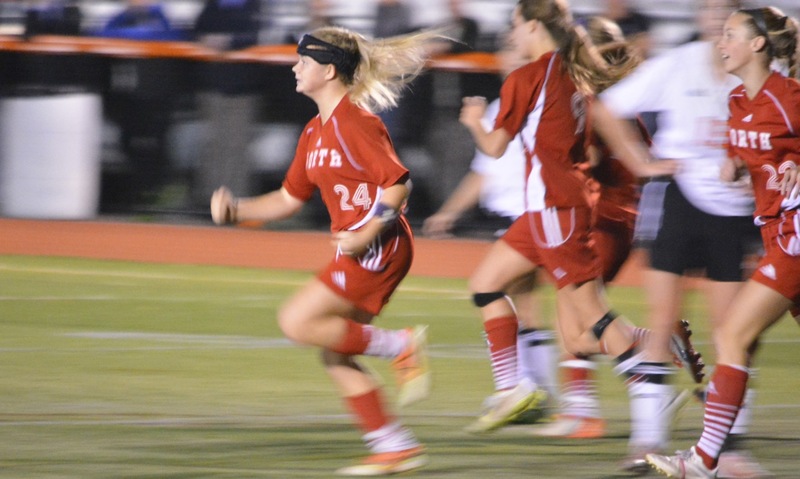 Foxboro, 4 @ Milford, 2 – Final – Kristen Franzini and Gabbie Riley each scored for Milford. Franklin, 1 @ Mansfield, 1 – Final – Franklin’s Molly Duncan scored early in the second half off of an assist from Halle Atkinson to put the Panthers up but Mansfield found the equalizer in the final 10 minutes. Amanda Mangano converted with just eight minutes to go to keep the Hornets undefeated (13-0-2). Stoughton, 0 @ North Attleboro, 5 – Final – Four players recorded two points in North Attleboro’s win at home over Stoughton. Haley Ferrin scored a pair of goals – “They were beautiful goals,” said North coach Bill Wallace – while Ashlyn Gaulin, Kayla Pasquel and Haley Guertin each scored once and had an assist. Britta MacDonald and Kenzie Rosenberg also had an assist for the Rocketeers. Stoughton head coach Tara Daniels said Gabby Diaz “played tough in the back field.” for the Black Knights. Taunton, 0 @ King Philip, 3 – Final – King Philip freshman Avery Snead netted the game winner in the 32nd minute of the game as the Warriors picked up the shutout win at home. “It was a rocket,” KP head coach Gary Pichel said of Snead’s goal. Julian Massarone doubled the lead in the 47th minute, converting a nice pass from Chloe Layne inside the area. Maddie Smith added an insurance goal just three minutes later in the 50th minute, converting a cross from Layne. Attleboro, 0 @ Oliver Ames, 3 – Final – Oliver Ames defended home court with a 25-18, 25-16, 25-18 sweep of Attleboro. OA senior Bridget McCarthy tallied 22 assists and three aces and senior libero Alyssa Gavin added 12 digs and two aces. Caroline Cavanaugh had four kills and “played aggressive on the net” according to head coach Chelsea Correia. Canton, 3 @ Sharon, 0 – Final – Canton picked up the sweep on the road at Sharon; “Everyone contributed to the win tonight,” Canton head coach Pat Cawley said. Nicole Poole led Canton with 16 assists, six kills and two aces. Emma Murphy added seven kills, three blocks and six aces. Sofia Connor, Malia Claiborne and Kehla Minkin all played good defense while Emma Gobbi played well at the net for Canton. Mansfield, 0 @ Franklin, 3 – Final – Franklin used the energy of senior night to sweep Mansfield, 25-20, 25-21, 25-20. “It was a strong performance by the entire team,” Franklin head coach Kate Horsmann said. Senior Erin Skidmore had 14 kills and 11 digs to lead the Panthers while Meaghan Maguire had six kills and three blocks, Lauren McGrath had 22 assists, two aces and a kill and Maddie Kuzio finished with 22 digs and a pair of aces. For Mansfield, Jess Haradon had 20 digs, Meg Hill had 10 kills and Emily Kleber had six kills. King Philip, 3 @ Taunton, 0 – Final – King Philip picked up the 25-23, 25-10, 25-20 sweep on the road. Sydney Phillips led KP with 15 kills and 14 service points while Kat Kmetz had four kills, three digs and 13 service points, Liv Balduf chipped in with five kills and 11 service points and Amanda Loewen had six digs and eight service points. Attleboro, 0 @ Oliver Ames, 3 – Final – Kayla Lozzi netted a pair of goals while Kendall Clifford found of the back of the cage once to pace OA. Katie Vamosi made six saves in net to preserve the shutout for the Tigers. Mansfield, 2 @ Franklin, 3 – Final – Franklin sophomore Annie Walsh scored a pair of goals with her sister Erin Walsh, a freshman, scoring once to lead Franklin to a 3-2 win. Franklin head coach Lisa Cropper said Cassi Ronan, Caroline Lounsbury and Kayla Marshall also played well for the Panthers. Attleboro, 0 @ Foxboro, 0 – Final – Click here for a recap of the game. Mansfield, 4 @ Milford, 1 – Final – Milford freshman Jordan Borges scored his first career goal off an assist by Marcello Panno to open the scoring but Mansfield netted four goals in the final seven minutes of the first half to get the win. Sean Lanzillo leveled the score off an assist from Ethan Brill-Cass in the 33rd minute, Cullin Anastasia put Mansfield up 2-1 on an assist from Kevin Bouck in the 35th minute, James Chotkowski made it 3-1 off an assist from Brill-Cass in the 39th minute and then Anastasia made it 4-1 off an assist from Lanzillo just 30 seconds later. Mansfield goalie Nick Ferraz replaced an injured Jed Tolbert in net in the second half and made 12 saves – head coach Steve Sheridan saying Ferraz played phenomenal. Milford head coach Brian Edwards said Zachary Brown and Mike Weber played extremely well for the Scarlet Hawks. King Philip, 2 @ North Attleboro, 1 – Final – King Philip senior Colby Koch opened the scoring for the Warriors, finishing off a one on one situation after a ball over the top from Tyler Mann. Jason Florio netted the game-winner in the 77th minute, finishing at the back post off a feed from Anthony Bozza. North Attleboro netted it’s goal in the 79th minute. 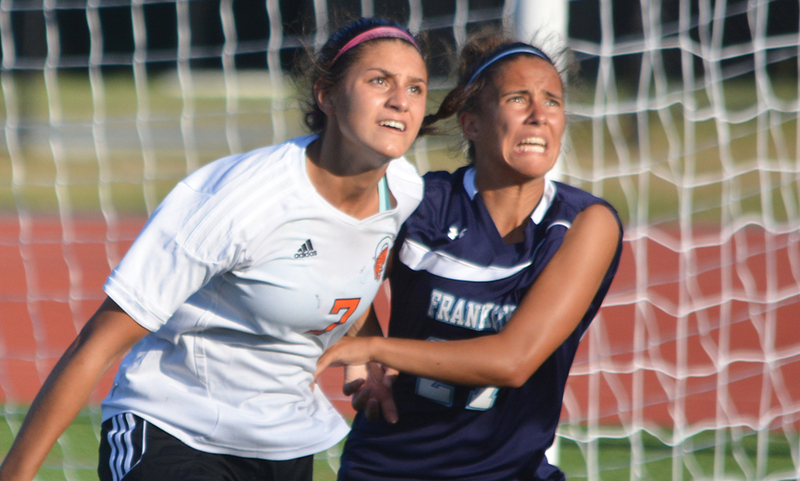 Taunton, 0 @ Stoughton, 4 – Final – Stoughton scored a pair of goals in each half to earn its seventh win of the season. Jordan Asnes opened the scoring with a shot into the bottom left corner after a cross from Marco Antunes. Antunes then set up Loubensky Lucas four minutes later, playing a through ball while Lucas lifted the ball over the keeper to make it 2-0. Senior Goddy Fombe made a nice run out of the back, putting a through ball into Lucas who ran onto it and slotted it home. Sophomore Fabio Ponce De Leon capped the scoring, flicking in a service from Conner Kavanagh at the near post to make it 4-0. Matt Gallagher earned his second shutout of the year in net. Canton, 2 @ Oliver Ames, 4 – Final – Oliver Ames scored two goals in each half to pick up its 10th win of the season. Tori Wyman, on an assist from Anna Tempestoso and Kiana Lozzi, on an assist from Abby Hodges gave OA a 2-0 lead at halftime. Jess Robarge, on an assist from Zoe Chazan) and Jackie Mills added second half goal for the Tigers. Milford, 0 @ Mansfield, 3 – Final – Hannah Reiter netted a pair of goals and assisted on Stephanie Kemp’s goal to lift Mansfield. Kemp also notched an assist in the win. Milford head coach Jay Mastaj said Nichole Dahlgren and Rachel LeBlanc played well on defense. North Attleboro, 0 @ King Philip, 3 – Final – King Philip scored three goals in the final 15 minutes to pick up the win over North Attleboro. Chloe Layne scored the game-winner, converting a corner kick from Emma Corcoran in the 65th minute. Kathrine Turner found Rachel Hogan, who volleyed her shot into the net to make it 2-0 with just under five minutes to play. Just 30 seconds later, Corcoran service another corner that Avery Snead latched onto to make it 3-0. Stoughton, 0 @ Taunton, 1 – Final – Izzy DaCosta netted the lone goal of the game to lift the Tigers. Stoughton head coach Tara Daniels said Emerson Sprague, Krista Michensi, Corina Kavengh and Sarah Widrow all played well defensively for the Black Knights. Mansfield, 3 @ Milford, 2 – Final – In a match filled with long rallies, Mansfield was able to edge Milford, 21-25, 25-19, 24-26, 26-24, 15-8. “It was an outstanding team effort by our whole team,” Mansfield head coach Melissa Heeden said. For the Hornets, Jess Haradon had 43 digs, Chloe Peters had 49 assists, Meg Hill added 14 kills, Julia Harrison chipped in with 12 digs and 10 kills, Jacey Anderson had 22 digs, Emily Kleber finished with eight kills and Olivia Broyles had seven kills. King Philip, 3 @ North Attleboro, 1 – Final – King Philip avenged a non-league loss to the Rocketeers last week with a 25-21, 25-18, 23-25, 25-20 league win on Thursday. Sydney Phillips paced the offense with 19 kills while adding 18 service points and three blocks. Kat Kmetz had 23 service points for the Warriors along with three kills and two blocks, Amanda Loewen had 11 service points and eight digs and Angela Vellante added 25 service points and two digs. Taunton, 0 @ Stoughton, 3 – Final – Stoughton’s Riley Bagley had a strong all around game with with eight kills and 16 digs. Oliver Ames, 0 @ Canton, 1 – Final – Andrea McNeil scored the lone goal of the game while Taylor Carrington recorded the shutout in net for the Bulldogs. Oliver Ames head coach Abby Tepper said Katie Vamosi, Katie Davenport and Sarah Tetrault played well defensively for the Tigers. Franklin, 5 @ Taunton, 1 – Final – Franklin sophomore Annie Walsh netted a hat trick to help the Panthers land a 5-1 victory. Junior Maddie Hinckley opened the scoring with junior Kate Morse and freshman Erin Walsh each chipping in with two assists. Sophomore Cassi Ronan also had a goal and an assist. Franklin senior Sam Hertzberg had six saves –including two scintillating stops — to get the win in the cage. King Philip, 2 @ North Attleboro, 0 – Final – King Philip’s Christina Hathaway scored a penalty stroke in the first half to give the Warriors the edge at the break. In the second half, with 11 minutes left, Nicole Connor scored from an assist from Alli Meehan to make it 2-0. KP put 30 shots on net but North Attleboro goalie Liz Morehouse had a strong game. Foxboro, 172 @ Oliver Ames, 143 – Final – Brady Allbritton earned match medalist honors for Oliver Ames, carding a low round of 34. Mark Bissonette shot a 35 while Ryan McGarry and Matt Kelley each shot 37 on the day. Chad Bearce shot a 42 for Foxboro and Matt Tierney carded a 43. Stoughton, 179 @ Canton, 154 – Final – Canton’s Tommy Dimock was the match medalist, shooting a match-low 34 on the day at Blue Hills Country Club. Jackson Maffeo added a 39 for the Bulldogs while Matt Martin shot 40 and Pat Duggan shot a 41. Brendan Campbell led Stoughton with a 41. NORTH EASTON, Mass. – North Attleboro shocked Oliver Ames during the regular season, beating the Tigers for the second year in a row and for the first time in 13 years at Kelly Field. On Thursday night, the two teams met again at Muscato Stadium with far more than bragging rights on the line. OA had the lead twice, but both times North bounced back and senior forward Hana Caster scored her third goal of the game with just seven minutes remaining to lift to the Rocketeers to a 3-2 victory in the opening round of the Div. 1 South tournament. The Rocketeers were certainly enthusiastic at the start, but it was the Tigers that jumped into the lead. Following an early chance for Francesca Calabraro that sailed over the bar, OA took advantage of a poor clearance on a corner and Jess Robarge knocked it in from six yards out. The lead lasted 13 minutes before Caster showed off her wheels to get on the end of a through ball by sophomore Haley Guertin down the middle of the field. Caster raced past the defenders and managed to get there just ahead of OA keeper Regan Benton, took a touch past her, and rolled it into the empty net. “We told her that we’re not going to put the ball down the lane; we’re just going to pop them up over the top and you chase after them,” said Pasquel. North Attleboro set out to limit the effectiveness of Calabraro with double teams, but OA still had chances in the first half with Jackie Mills heading straight at North keeper Kiersten Bixby and then twice Lauren Wright went close but could not find the back of the net. The Tigers pressure paid off in the 35th minute when Calabraro was brought down in the box. Delaney Benton stepped up to put away the penalty and restore the lead. The Rocketeers almost equalized right after the restart but Caster was denied on a breakaway by Regan Benton. Caster tied the game for a second time nine minutes after the break. Again she sped past her markers on a quick counterattack. Her first shot was saved by new keeper Bethany Dunk but she settled the rebound and fired it into the back of the net. The game was mostly a stalemate in the second half, thanks in large part to the play of the North Attleboro defense, which limited OA’s normally potent offense. The Rocketeers central defenders, Rachel LaBonte and Emily Chiasson closed down the middle of the field. The Tigers nearly restored the lead in the 67th minute when Kiana Lozzi got free in the six-yard box, but Bixby got down quickly and blocked the chance. That was a crucial stop, as six minutes later the Rocketeers took the lead. A scramble in front of the OA goal was not cleared properly and Caster managed to escape a crowd, find the ball, and score her third of the night to send the Rocketeers into hysterics. “That always happens when there is such a big jumble and you see the ball in front of the net and I just got my foot on it,” she explained. With three minutes left, OA had one last chance when Delaney Benton got free down the left flank but her cross just missed Calabraro racing in at the back post and went out for a goal kick. The Rocketeers may get a second straight Hockomock League rival as they await the winner of Franklin and Walpole, which will be played on Friday afternoon. #12 King Philip, 1 @ #5 Mansfield, 2 – Final – Senior Jake Staples scored with just over 10 minutes left off a Max Gurnon free kick to lift the Hornets. Kevin Bouck scored in the first half for Mansfield to make it 1-0 while Mike Rowe leveled the game shortly into the second half. Mansfield advances to the D1 South Quarterfinals and will travel to #4 Needham on Sunday, 11/8 with a time yet to be announced. #7 Franklin, 5 vs. #10 Marshfield, 0 – Final – Austin Kent hooked up with Nick Parent twice in the first half, as Parent finished off a pair of corner kicks to give the Panthers a 2-0 lead at the break, Kevin Hall made it 3-0 off an assist from goalie Henri Guilmette, Kent made it 4-0 off an assist from Cam LeBlanc and Farley Asmath made it 5-0 off an assist from Brian Czuba. Franklin advances to the D1 South Quarterfinals and will travel to #2 Brockton on Saturday, 11/7 at 6:00. #11 North Attleboro, 3 @ #6 Oliver Ames, 2 – Final – Hana Caster scored a hat trick for the Rocketeers to lead North to a come from behind victory in the Div. 1 South opening round game. OA took the lead twice on a Jess Robarge goal from a corner and a Delaney Benton penalty, but both times Caster scored to equalize. She scored the winner with seven minutes remaining. North will face the winner of Franklin and Walpole. #14 Foxboro, 0 @ #3 Canton, 2 – Final – Tessa Cudmore scored less than a minute in and Hannah Link added a second midway through the second half to lift Canton. The Bulldogs advance to the D2 South Quarterfinals and will host #6 Medfield (11-4-4) on Saturday, 11/7 at 4:00. #6 Franklin, 3 vs. #11 Wachusett, 2 – Final – Franklin rallied from a 2-1 deficit, winning a marathon fourth set and then pulling out a win in the fifth set to get the 18-25, 25-21, 13-25, 30-28, 15-13 win. Head coach Kate Horsmann said Erin Skidmore had clutch serving down the stretch in the vital fourth set, finishing with a pair of aces and eight blocks. Dayna McCue had 46 serve receives, 25 digs and six aces and Beth Neal had 13 assists, six kills and six aces. Franklin advances to the D1 Central West Quarterfinals and will travel to #3 Natick (14-2) on Saturday. The game is scheduled for 3:00. #7 Taunton, 3 vs. #10 Plymouth South, 0 – Final – Taunton advances to the D1 South Quarterfinals and will travel to #2 Mansfield (14-5) on Monday, 11/9. The game is currently scheduled for 7:00. #9 North Attleboro, 3 @ #8 Bridgewater-Raynham, 1 – Final – After dropping the first set, North rallied for three straight. The Rocketeers advance to the D1 South Quarterfinals and will travel to #1 Barnstable (18-1) on a date and time to be announced. #11 Stoughton, 0 @ #6 Cardinal Spellman, 3 – Final – Stoughton bowed out of the postseason with a 23-25, 19-25, 10-25 loss. Bridgette Whalen had 20 digs, 15 service receptions, five kills, eight service points and two blocks, Bianca DeSousa had 12 digs and 16 assists and Valerie Whalen finished with eight digs, six kills and six service points.